When a gardener becomes a tourist in a new city it can be difficult to find local private gardens to visit. Botanic Gardens are great places to get first impressions of the local plants and gardening styles (and some healthy exercise). Real gardeners often won't take time out of their own gardens to tour the world. They'd rather spend holiday money on truckloads of manure, or a new pond with real man-sized rocks. And when they do get out, they make terrible garden reporters - their minds are usually preoccupied with the humble state of the garden back home! That's certainly what it's like for me! So please be forgiving as you read about the Botanic Gardens I've visited. Sometimes I've even tried to take proper notes, write down plant names, and the like. Finally I have made the true gardener's pilgrimage - to Sissinghurst Gardens in Kent. Now I can chat about THE most famous white garden in the world. I can hold my own in gardening small-talk. Yippee! I visit the Ilam Botanical Gardens each year in spring to see the deciduous Azaleas. They make a grand show, layers of flame coloured flowers underneath the large rhododendron trees. But this year I had a special reason. You simply must visit Inverewe Gardens, said my 'Scotaholic' friend, who isn't even a gardener. And so I drove happily over the scenic A87, turned into the huge car park, and took a deep breath. This was a real test of my - talent? Would I enjoy meeting the Grand Auntie of all Scottish gardens? Writing about Leckmelm, a restored Victorian Arboretum, will be one of my biggest journalistic challenges. There's definitely a limit to the number of times one can use the phrase 'huge trees with towering trunks', before impact is lost! It's wonderful that the Singapore Botanic Gardens have installed several official pieces of garden art. But to my eyes there are much stronger sculptural elements inherent in the gardens themselves. The first garden (and nursery) I visited in Scotland, Abriachan, had a secret and private feel, though it proudly had its own official brown open-garden road sign. Abriachan nestled on the hillside overlooking that famous stretch of Scottish water, Loch Ness. I've just been to the old-fashioned rose garden in the local Botanic Gardens. What a beautiful display! The roses are allowed to grow so naturally - they can climb, or sprawl, as takes their fancy. I usually visit the Christchurch Botanic Gardens not quite knowing what I'm looking for, and come home with nothing but duck photographs. To improve my random garden reporting, this spring I decide to take a guided tour. Soon to be an intrepid world garden tourist, I have been practising in the local Botanic Gardens - important things, like trialing my new (budget) summer walking shoes, and testing my stamina for walking on paved paths (ouch - sore feet). I've just paid a mid-spring visit to the Christchurch Botanic Gardens - to seek out dramatic scenes of plant and tree destruction after last week's spring snow storm, and to take photographs of the Magnolias, the Azaleas, and assorted mid-spring things. Speed, bonny gardener, like a bird on the wing... over the sea to Skye. That's the Isle of Skye in Scotland, where I recently visited two wonderful gardens. And there's a bridge, too. Firstly I went along the coast road to visit the gardens at Armadale. Autumn in my garden is very small and simple. Three Maples and four Dogwood trees are going red. Two Elms and my one Willow tree are going yellow. So I've been out in search of autumn on a larger scale - at the local Botanic Gardens. 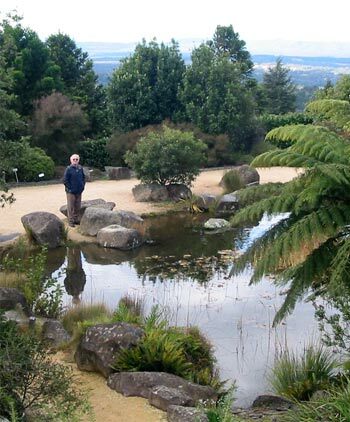 This is the report of my first prepared visit to another garden - my return visit, with notebook and pen (and walking friend), to the beautiful Christchurch Botanic Gardens. On my second visit as a roving garden reporter to Mona Vale Gardens in Christchurch, New Zealand, the roses were flowering. In the early summer sun I tried my best to be a serious garden visitor - taking sensible photographs, noticing vistas, and peering at the labels.